If you’re just stopping by Polioptics for the first time, please begin at the beginning: Polioptics Part 1: Polioptics 101. It’s well worth reading the narrative in sequence. What draws a young man spend a good chunk of his formative years thinking about and planning for a chance to work at the White House? Some kids harbor a fascination with baseball. It could be the dexterity involved in fielding, the hand-eye coordination of hitting or the statistical complexity of coaching. At the White House, it could be the diplomacy involved in national security, the social engineering of domestic policy or the storytelling imbued in speechwriting an event production. For me, it was a fascination with history and the opportunity to stage-manage scenes that would find their way into textbooks, from the South Lawn to the Normandy Coast. But as with any kid who arrives at a multi-pronged fork in the road, one tangent which might lead to medicine, another veering toward manufacturing or a third toward public service, it had to start somewhere. It may as well have been with images. Let’s take a trip back to Boston. If you’re a U.S. resident of a certain age, whether you’re a Democrat, Republican, Independent, or something else, you grew up with certain images circling through your head that, collectively, comprised the American story. Whether you brushed past these pictures in your grade school textbook or, entranced by them, made your way to the nearest national monument, is a matter of personal preference. It also probably had something to do with your parenting: how willing and patient mom and dad were to load you and your noisy siblings into the Caprice Classic for a family road trip. 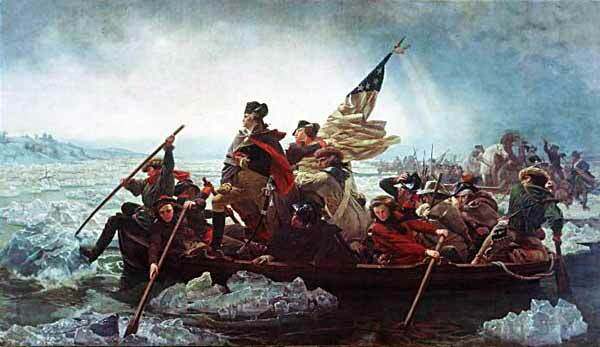 I’ve been a sucker for American history since way back. Long before Ben Affleck used The Town to make Boston a backdrop for bank robbing, Charlestown, Massachusetts was the site of “The Whites of Their Eyes” at now-dismantled the Bunker Hill Pavillion, an epic multi-media show and diorama that brought the American Revolution, depicted mostly in oil-on-canvas, to life. Bunker Hill Monument is a stop on Boston’s famous Freedom Trail, willed into existence in 1951 by Bill Schofield, an editor and columnist for the old Boston Herald Traveler. 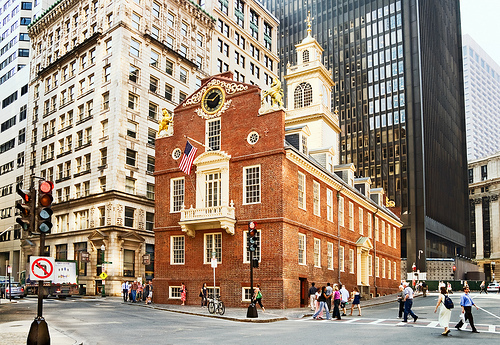 Another stop on the Freedom Trail is the Old State House, which was the center of Boston’s civic life in the 18th Century. 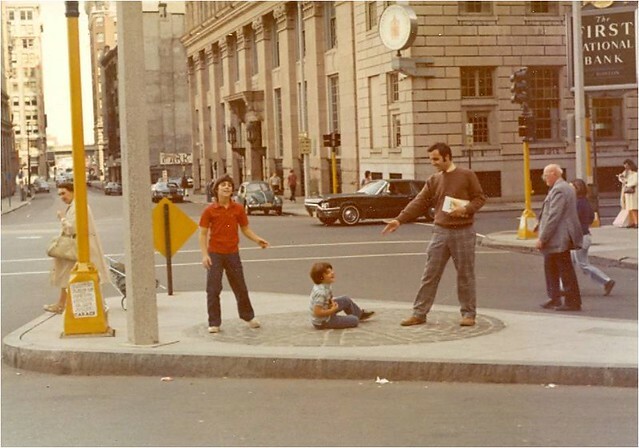 Over 35 years ago, that kid grabbing his gut on the streets of my hometown, circa 1974, is me, recreating the seminal moment of the Boston Massacre which happened outside the front door of the Old State House on March 5, 1770. My dad and brother are playing the part of British troops and rebellious colonists, clogging the thoroughfare with some theatrics. 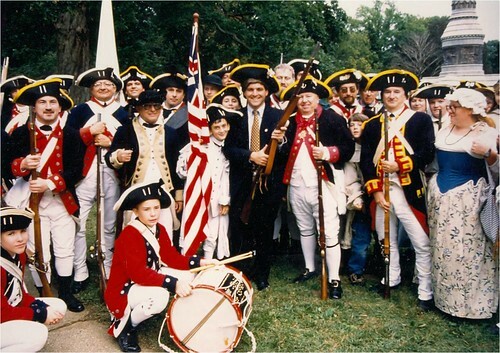 For someone who as a young fellow dressed at Halloween as Patrick Henry and who now continues to read new biographies issues by the likes of Joseph Ellis, David McCullough, and Walter Isaacson, Boston around the time of the Bicentennial was the place to be, hanging out in the footsteps of the Founding Fathers. 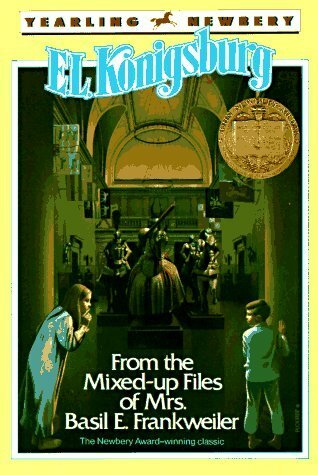 But Boston in ‘76 had a dark irony not so visible, or understandable, to a 10-year old whose most valuable possession was his replica Civil War musket bought at a souvenir store somewhere near Gettysburg. Beneath the veneer of its storied heritage, the cradle of liberty was home to a searing racial divide over forced busing. For me, collecting stamps was a way to explore history. My dad would bring me to the Norumbega Stamp & Coin on Saturdays. I could pick out a few stamps and bring them home for my album, wrapped carefully in a wax paper envelope. Long before the event became the defining moment of protest for a political movement, postage in 1973 brought to life a 200-year old tea party. I’ve never been much into poetry, but it’s hard to dislike the cadence and rhymes of Longfellow’s Midnight Ride and the images it conjures. 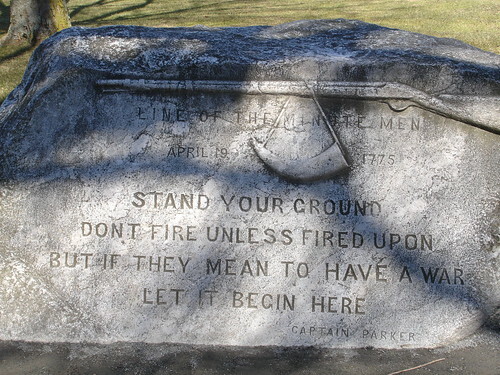 To make it more real, my dad, who volunteered as our Cub Scout den leader, brought us face-to-face with Captain John Parker’s immortal quote etched in stone on Lexington Green. On a trip to the Metropolitan Museum of Art in New York, fresh off a reading of E.L. Konigsburg’s From the Mixed-up Files of Mrs. 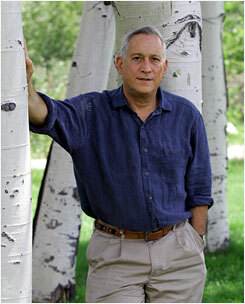 Basil E. Frankwiler, I saw George Washington cutting a striking posein the American Wing. Emanuel Gottlieb Lutze’s hagiography has been shown to be less than accurate, but it positioned our First President perfectly in the eyes of elementary school students. Four score and seven years later, here’s Alexander Gardner’s wet-plate Collodion of Lincoln and McClellan at Antietam. The message of the early photo of a president towering over his field commander was as indelible then as it is now: “fight, or you’re done.” As I often point out in my talks on political imagery, the early photographs of Gardner and Mathew Bradywere the forefathers of a long tradition of coverage of Commanders-in-Chief heading to the front lines to meet with their generals. In my time at the White House, I had a hand in many such excursions, but perhaps nothing with the resonance of President Obama summoning General Stanley McChrystal to the forward cabin of Air Force One for a serious talking-to. FDR, his handicap carefully shielded from view, made a deep impression on a young history student looking at pictures of the president touring America’s Arsenal of Democracy. Few youngsters failed to appreciate the imagery—however orchestrated it may have been—of MacArthur working to keep his promise to return. Behind the lens, photographers bore the same risks as soldiers they covered. Gradually, I got to know the names behind the shutters. Joe Rosenthal’s work on Mt. 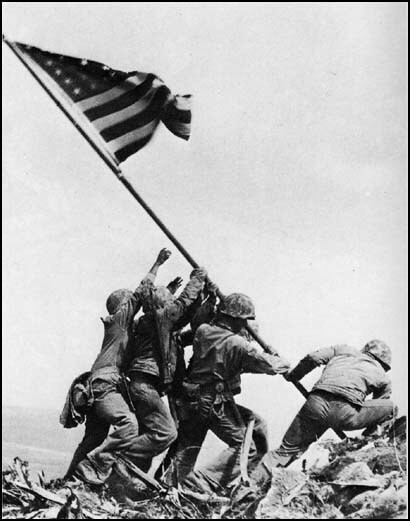 Suribachi still captivates, serving as the subject of movies like Flags of Our Fathers. 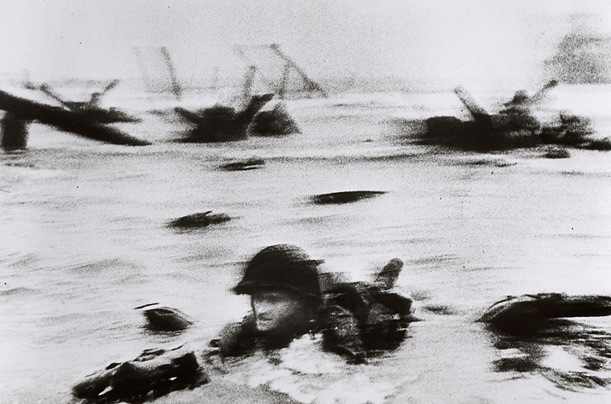 Robert Capa’s grainy images on the early arrivals on Omaha Beach guided me as I worked on the 50th Anniversary of D-Day at the White House in 1994 and inspired Steven Spielberg to direct the harrowing opening scenes of Saving Private Ryan. 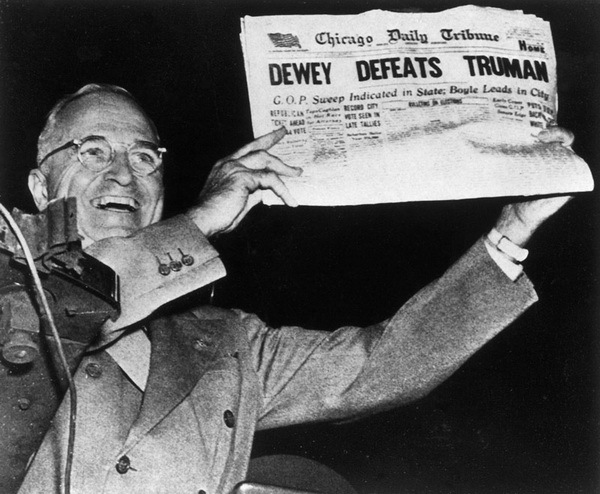 Back home, the war over, eyes were drawn to Harry Truman, and the most inaccurate headline of all time (until, perhaps, the first headlines following the results of the 2000 election night). Truman’s successor, Dwight Eisenhower, brought the White House into age of live TV. His first news conferences created the model for hundreds that followed, waxing and waning in grandeur depending on who happened to occupy 1600 Pennsylvania Avenue. What kid raised in the ’60′s and ’70′s, especially in Boston, wasn’t indoctrinated into Kennedy worship? But for Kennedy, images of a happy family in Hyannisport, or making a life for themselves inside the White House, belied a more complex reality. 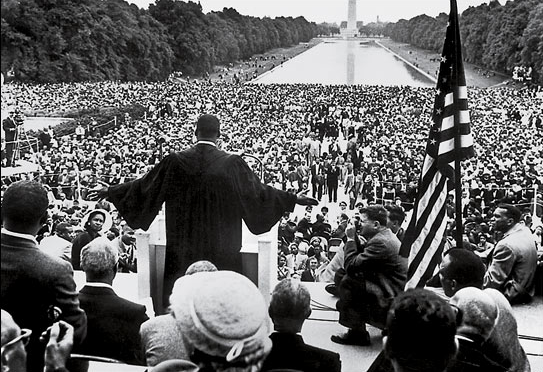 Many study Martin Luther King’s “I Have A Dream” speech for it’s unparalleled message and rhetorical construct. But would it have been remembered with such reverence without the crowd that assembled to hear it? That’s what struck me. 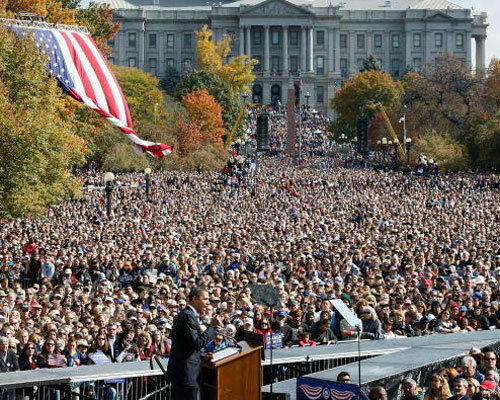 The mass of humanity—estimated at 200,000—that gathered on August 28, 1963, was a crowd for the ages (until Obama’s mastery of the Internet made enormous crowds common in the U.S.). 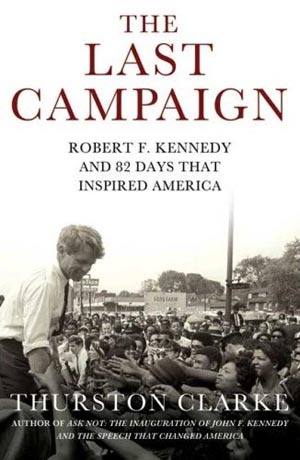 If anything captures RFK’s all-too-brief campaign, it’s the ride through crowded streets in an open car, a visual now rendered largely extinct by the realities of security. 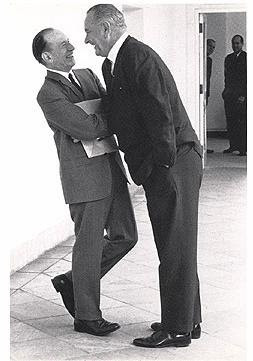 The access to intimate presidential moments given to privileged photographers shows political power at play. Here’s what’s commonly known as “the Johnson Treatment.” There’s simply no place to hide if you’re a senator standing between the president and passage of important legislation. And, like Armstrong landing on the Moon, for all that the image on the Sea of Tranquility represents, when a president steps foot in someplace new and exotic, it makes lasting news. 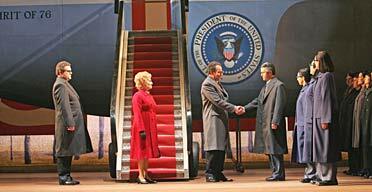 Nixon in China qualified as such, and was even made into an opera by the American composer John Adams fifteen years later. Finally, of course, leaving a place for good also makes an lasting mark on an impressionable kid. Nixon flying off into retirement in August 1974 brings us close to the celebration of American Independence in 1976, returning to where we began this post on Founding Fotos, in Boston. At the time, I was floored by an image that doesn’t fit the mold, except in its historic significance and impact on me. It was a few months shy of the Bicentennial. My anticipation ran high. 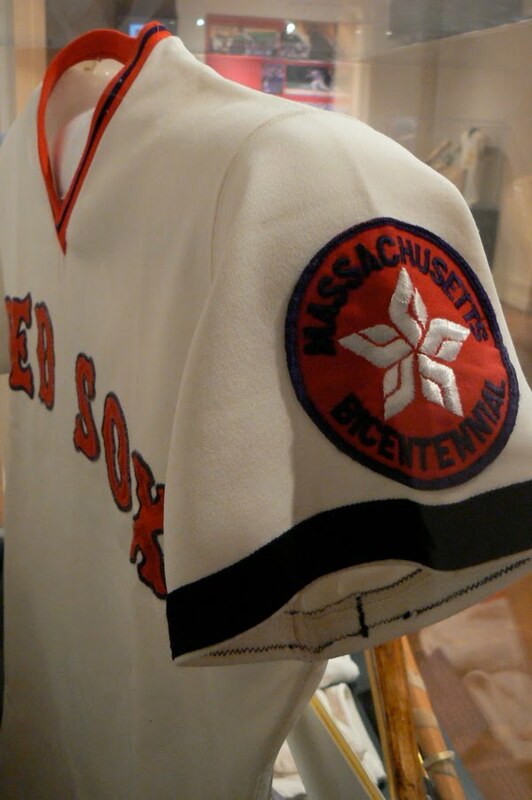 To honor the year, as my hometown Red Sox did with their uniforms, my mother sewed commemorative patches on every pair of my shorts as I prepared to head to summer camp. I was 10 years old. In the morning, I would fetch the paper from the driveway and bring it to my dad. 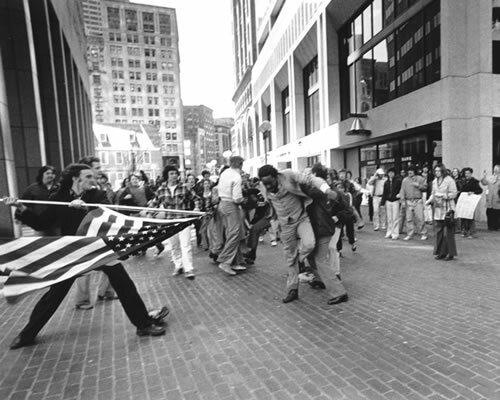 On one of those spring mornings—April 6, 1976–the image on page 1 of the Boston Herald American, the most important shot in the paper, told a story not of national pride, but of national anger, taken steps from where the Boston Massacre killed Crispus Attucks and fomented a revolution. Every historical image that I had absorbed about America, up to that moment, had to be weighed against this contemporary example of photojournalism staring me in the face. I looked at the paper. 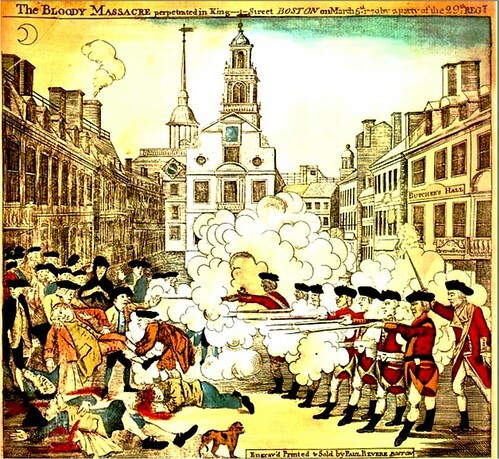 My mind floated back to that moment with my dad and brother outside the Old State House reenacting the Boston Massacre. It floated back further to the history books. The assault on colonials was immortalized by this Paul Revere engraving. The assault on a black lawyer named Ted Landsmark, was immortalized by Herald Photographer Stanley Forman. As the story goes, minutes before Joseph Rakes tried to spear Landsmark with an American flag, Forman stopped to buy an apple for his girlfriend. Then, like Rosenthal at Mount Suribachi or Capa at Omaha Beach, history happened right in front of him, a shocking image that won the Pulitzer Prize. The rest, as they say, is history. Paul Revere’s engraving took weeks to produce and years to circulate through the colonies. Today, an image shot by an AP photographer or a bystander with a cellphone takes seconds to make its way from the camera’s lens to the screens of millions of smart phones. Was it possible to be a little naive about America leading up to the Bicentennial? I was 10 years old, and there weren’t any iPhones to give me instant access to the British press and disabuse me of an idealized image of history. 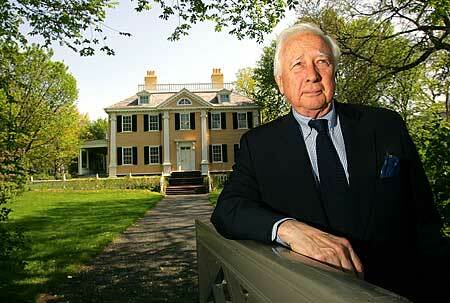 And, truth be told, it has always been hard for this patriot to pass up the compelling allure of America’s history. During the closing weeks of the 1996 reelection campaign, we were setting up the site for a rally for President Clinton in the Township of Freehold, New Jersey. It wasn’t lost on our advance team that the pivotal Battle of Monmouth was fought nearby on a boiling summer day in 1778, with many of the heralded names of the Revolution present: Washington, Lafayette, Benedict Arnold, Anthony Wayne, Charles Lee, Alexander Hamilton, Baron van Steuben and even Molly Pitcher. In the hours before the rally, on what’s known as Game Day in advance circles, we noticed some Continental Army reenactors drilling nearby. “Why not make them part of the scene,” we asked. It was too late in the game to run the traps through headquarters, but we loved the symbolism of involving the brigade and called an audible. The soldiers formed a perfect cordon and through the line the president marched, his gait quickened by the rhythm of an authentic fife and drum cadence. When the event was over, I couldn’t resist grabbing a musket and tri-corner hat and staging a photo op of my own. As the decades have passed, American culture, from marketing to politics, has become ever more dependent on influencing people through imagery. In the posts that follow, we will track that trend as it plays out on the national stage, a process that gets increasingly complex with each new arrival to the Oval Office. If you missed Part 1 of the story, read it here: Polioptics Part 1: Polioptics 101.